Technology exists to save time. So why not harness it to speed the justice system. That’s exactly what Det/Sgt. Jeff Pearson of the Organized Crime Enforcement Unit did through the creation and implementation of two technological innovations that have resulted in incalculable time and cost savings for Ontario police services, courthouses and the judiciary. He devised the eReport for officers to obtain court orders to hold important evidence. It’s an upgrade of the Report to Justice document that’s required to be filed at a courthouse whenever an officer seizes evidence. Prior to last October, officers would prepare the four-page reports and then drive to the courthouse where they would wait in line to present the facts of their seizure to a Justice of the Peace. On average, it took police officers in Ontario over an hour to process a Report to Justice. In Toronto, close to 400 reports are filed monthly. Across the province it’s over 1,000. To support Ontario Police officers so they can better serve their local neighbourhods and reduce wasted hours of travel, waiting and court processing, Pearson devised the eReport that’s an email exchange of digitally signed documents between officers and Justices of the Peace. The intuitive website allows officers to prepare and send eReports. Pearson first started working on the first version of the project six years ago, constantly refining the process until it reached its current state, while working closely with the Ministry of the Attorney General, the judiciary and local courthouse staff. “The whole goal behind this is to support our officers so they can simply send an email directly to a Justice of the Peace to avoid taking extra time going to a courthouse and sitting on a bench while waiting for a Justice of the Peace,” he said. In addition to Toronto Police, several police services in the province, including Barrie and York Regional police services have adopted the eReport process. Other police services across the country have shown an interest. The savings have been considerable since the project launch five months ago. Nearly 900 policing hours have been saved through the 1,500 eReports that were successfully filed at courthouses. Also, approximately 6,000 pages weighing about 55 pounds didn’t have to be filed at a courthouse, court staff hours were freed up and printing costs have been avoided. Deputy Chief James Ramer, S/Supt. Myron Demkiw and Inspector Don Belanger supported the initiative. “Without their command level support, this never would have got off the ground,” said Pearson, noting the help of Frans Beyer and Marva Carter of Information Technology Services, Pedja Ljubomirovic of Corporate Communications, Kristy Antram and Dwayne Scott of the Integrated Gun and Gang Task Force, Deputy Director of the Ministry of the Attorney General’s Guns and Gangs Unit Philip Enright for their ongoing support. The second innovation started in 2015 when he was invited to participate in an eTelewarrant working group. Prior to that, officers were using fax machines to apply for search warrants during emergencies and courthouse closures. “Fax machines are slow, taking about 30 seconds per page,” Pearson said. “Some of the documents that officers were sending to the Justice of the Peace were upwards of 60 pages. That’s almost 30 minutes just to send the fax, not to mention paper jamming in the machine. Often when officers were applying for these search warrants, there’s urgency because of the dangers to public and officer safety that exist. The delays created also resulted in overtime costs and inconvenience to community members who were displaced from their homes. Pearson built a user-friendly website that contains tutorial videos, ‘How to’ cheat sheets and a trouble shooting section that allows officers to easily find solutions to common challenges. Ontario police officers use the website nearly 300 times every month. 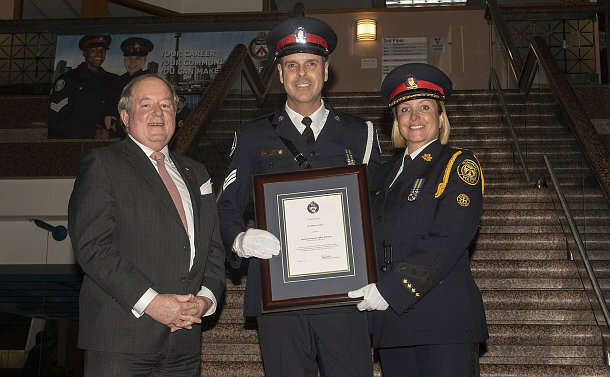 On March 27, Pearson was the recipient of a Chief of Police Excellence Award for devising and implementing the cost and time-saving initiatives. Belanger nominated the veteran officer for the award. He said Pearson’s commitment and dedication are exemplary. Belanger said Pearson’s efforts have created huge efficiencies for Ontario police services. Constable Paul Ramos of 14 Division was also the recipient of a Chief of Police Excellence Award. Identifying the need for investigators to have expedient access to CCTV footage, Ramos proposed and drove the development of a web-enabled Camera Asset mapping tool. 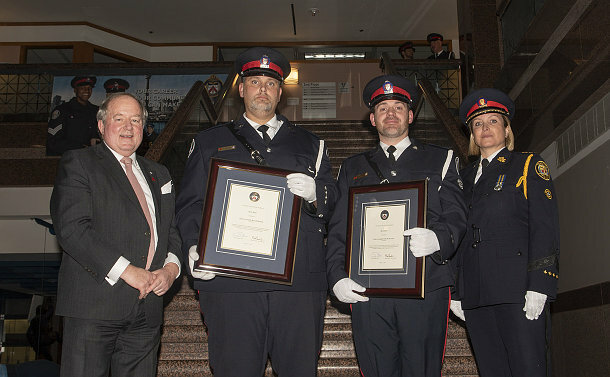 Merit Awards were presented to 11 Division Constables Russell Barnett and Josh McSweeney for their rescue of two men trapped in an elevator filling with water. The Toronto Police Services Board grant the honour for exemplary acts of bravery, performance of duty, community policing initiatives or innovations and initiatives that enhance the Service’s image or operation. Responding to a call for help for two people trapped in an elevator in the basement with water quickly rising during a powerful rainstorm last August, Barnett and McSweeney swam through mud-filled water and used a crowbar to open the elevator door and free the men. “It was only as a result of their actions that we can tell a story of heroism rather than tragedy in this case,” said Toronto Police Services Board Chair Andy Pringle. A total of 93 Teamwork Commendations were presented to active and retired civilian and uniformed members. They included a group of 16, led by S/Sgt. Tam Bui, that helped bring the perpetrators to justice for the March 2011 murder of Allan Lanteigne. Eleven non-TPS members involved in the case, including Supt. Yvan Rivard and Sgt. Marie Damian of the Royal Canadian Mounted Police, were awarded Letters of Recognition. Nearly eight years after the crime, two suspects were convicted of first-degree murder and sentenced to life in prison with no eligibility of parole for 25 years. Several of Lanteigne family members travelled from New Brunswick for the ceremony. “We are so honoured to have you join us and it’s so meaningful that you are part of this awards ceremony,” Pringle said. From a TPSB standpoint, he noted that it’s important to recognize individuals whose dedication and heroism make Toronto a better place. Deputy Chief Shawna Coxon thanked the award recipients for their dedication and professionalism in going above and beyond the call of duty. She also acknowledged their families and friends who attended the event.